XTAM includes an option to run a discovery across your network to locate and report on found privileged endpoints and their configurations. This scan can be configured to be automatically run at scheduled intervals and the resulting report can be used to create new records that can immediately be placed under management. In addition, the Auto-Import option will create Records for newly discovered hosts. A scan of your corporate network that will identify all endpoints that respond. A regular report that includes a list of all endpoints discovered as well as information about itself. To more easily create managed records from endpoints found that are categorized as privileged. Multiple options that will allow for customizing the scan to fit the design of your requirements. The following discovery queries are available. Active Directory Query: This query creates a scan across the entire network using the supplied Active Directory account(s) to attempt to communicate with all found endpoints. IP-Range Query: This query creates a scan across a specific range of IP address (From – To) and attempt to communicate with the found endpoints using PowerShell (Windows) and SSH (Unix/Linux) in combination with the supplied account(s). CSV-Based Query: This query creates a scan based on the endpoints that are supplied using an external CSV file. If a list of endpoints is already available to your, then this option will use that for the input of the scan and attempt communication using PowerShell or SSH in combination with the supplied account(s). Click to download a sample CSV template. 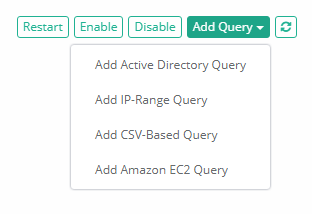 Amazon EC2 Query: This query creates a scan based on accessible EC2 images running in Amazon AWS environments. AWS Keys, regions, credentials and other information is required in order to successfully complete this query. For more information, please read our Discovery for AWS article. How to create an XTAM Discovery Query. Navigate to Administration > Discovery. Create a new Discovery query by clicking the Add Query button and then selecting the desired Query type as described in a previous section of this article. For Amazon EC2 Queries, please see our Discovery for AWS article for configuration details. Name: (All) The name of the discovery query. IP From: (IP-Range Query) The starting IP address for the range. IP To: (IP-Range Query) The ending IP address for the range. Use PowerShell: (IP-Range Query, CSV-Based Query) Check the box to enable the use of PowerShell for the scan (for Windows endpoints). Only PowerShell or SSH can be selected per query. If you would like to use both Protocols, then a second query must be created. Use SSH: (IP-Range Query, CSV-Based Query) Check the box to enable the use of SSH for the scan (for Unix or Linux based endpoints). Only PowerShell or SSH can be selected per query. If you would like to use both Protocols, then a second query must be created. Non-Standard Ports: (IP-Range Query, CSV-Based Query) Comma-separated list of non-standard ports to try during host discovery. If not specified the discovery process will attempt to connect to a remote host using port 22 for the SSH protocol and to the WS-Management port 5985 for rhe PowerShell protocol. Upload CSV: (CSV-Based Query) Upload the CSV file that contains the list of endpoints to be included in the scan. Click the Sample button to generate a CSV file that can be used as a template for proper formatting. Accounts: (All) Enter the account(s) that will be used to attempt communication with the found endpoints. You may add one or more accounts for each discovery query. Enable Auto-Import: (All) Check this box to enable the results of this query to be automatically imported and created as managed records. This applies to newly discovered hosts only. Record Type for Auto-Import: (All) Select the Record Type that will be used when creating the auto-imported hosts. This record type will be applied to all auto-imported hosts. Folder for Auto-Import: (All) Select the container where the hosts will be automatically imported into. If leave empty, all discovered hosts will be imported into the XTAM Root Folder. Auto-Import Filter: The auto-import process will only import records that contain either the Windows Service or Service Account (Log On As or Run As…) that is selected by this provided filter. Use connected account: Auto-import process will use the account successfully connected to the destination host during discovery process as an account on record. Use referenced account: Auto-import process will use the specified referenced record as an account on record. Use this option when several discovered and imported records reference the same account. Use provided account: Auto-import process will use the specified account as an account on record. Use this option to associate specific account with the newly imported records. Typically, a record type shadow account is used to set password for the imported record. Reference Record for Auto-Import: (Use referenced account) Auto-import process will use the specified record as a referenced record for all imported records. Typically, this option is used when several imported records should reference the same account (such as Windows domain Administrator). Account for Auto-Import: (Use provided account) Auto-import process will use the specified account as an account on record for all imported records (for example, Windows local Administrator). Typically, record type shadow account will be used to set password for the specified account upon record creation. Auto-Import Name Check: (Active Directory query only) Check this box to enable the hostname verification check prior to auto-import. If the checks succeeds, the record will be imported; if the check fails, the record will not be imported and a message will be added to the report. Enable Query: (All) Check this box to enable the query. Uncheck to disable the query. Sample: (Active Directory Query, CSV-Based Query) Click the sample button to generate a sample configuration that can be used as a template for proper configuration. Check the Enabled option to enable the query or leave it unchecked for it to remain disabled. Once a newly enabled Discovery query has been saved, it will be added to the XTAM Job Engine queue to begin. How to review a Discovery Query report. Next to any Discovery Query that has already been completed, click the View button to open this query’s report. All: Displays all the endpoints that were found regardless of the response. Open Port: Displays the endpoints that were found with an open port (PowerShell or SSH) regardless of the response. Connected: Displays all the endpoints that were found and communication was successfully established using one of the Accounts provided in the Query. Use the Search box to locate a specific endpoint and use the CSV or PDF options to export the results to a file. The following information and actions can be taken from the Discovery Query Report. You can learn additional information about the endpoint by clicking its View button. This may provide information about the endpoint’s connection time, status, Operating System, Administrators group membership, custom Services and more. Search to locate specific endpoints and export results to either a CSV or PDF file. Sort report based on column headers to more easily organize and locate privileged endpoints. 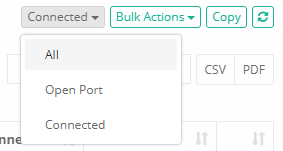 Automatically create new managed records from Connected endpoints by selecting its row(s), clicking the Copy button and then Pasting it to an appropriate location in your XTAM Records. Please note that the ability to create records from Discovered endpoints is only available when its Status is Connected. By default, Discovery Queries are configured to be run every 120 minutes. New queries will be added to the job queue when saved; however existing queries that are edited will not be updated in the queue. At any time, you may select a query or multiple queries and click the Restart button to add them to the queue for processing. Navigate to Administration > Settings. On the Application Nodes tab, click on the node defined as the Worker to open its configuration. Locate the option labeled Discovery and modify its value as needed. Value is based on minutes between scans.